56 years, 2 months, 20 days old age. Daphne Ashbrook will turn 57 on 30 January, 2020. Only 9 months, 10 days, 9 hours, 53 minutes has left for her next birthday. Daphne Ashbrook has celebrated the total number of 56 birthdays till date. See the analysis by days count and bar graph. 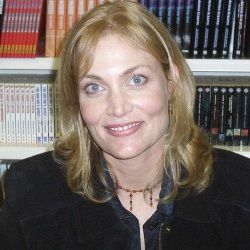 Daphne Ashbrook was born on 30th January 1963 in Long Beach, California, USA. She is an American Actress and Writer. She is best known for roles in films like Doctor Who, Intruders and Automatic. Since she was born into a family of Actors and Directors, acting came naturally to her. Her childhood was spent by watching their parent’s performing in theater. She made her acting debut at the age of six and a year later she essayed the role of Shakespeare’s daughter Susanna in a play titled A Cry of Players. She catapulted to limelight with her role of Dr. Grace Holloway in the film Doctor Who and her role of Melora in the film Star Trek: Deep Space Nine. She became the first American Actress to be a part of both the franchise. In her illustrious career, she has starred in several TV movies and Mini-Series including Rock Hudson and The Love Letter amongst several others. Apart from acting she is also a singer and released her first music record "Grace Notes" in 2010. Her album had the elements of jazz and pop. She has a daughter Paton Ashbrook with her former partner Lorenzo Lamas. Her present partner is producer and director David Vito Gregoli.